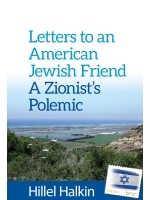 Letters to an American Jewish Friend: A Zionist Polemic, by Hillel Halkin, Geffen Books, 2013, 246 pages. 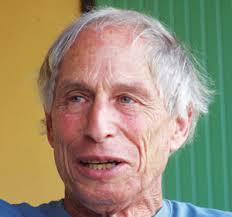 Hillel Halkin was born in 1939 and moved to Israel in 1970. 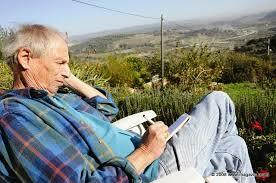 He is an author, a translator and a columnist. The son of a professor at the Jewish Theological Seminary of America, he had a Jewish education and religious background, but now considers himself secular. Hillel Halkin has lived in the northern Israeli town of Zichron Yaakov, located on a hilltop overlooking the Mediterranean, since he relocated here. The first thing I must say is that Hillel Halkin can really write. I may be somewhat of a snob when it comes to these things, but I have expectations when I read any type of non-fiction. The first is that the writer actually did his homework and conducted the proper research. Then he should give a well reasoned argument in defense of a thesis or tell a compelling narrative of some sort. Finally he must know how to write. First published in 1977, Letters to an American Jewish friend has just been rereleased in paperback by Geffen Publishing House. I have had an extensive education in both Jewish history and Israeli/Zionist history. I have been an avid reader of books on both subjects since my youth. That is why I am almost ashamed to admit that I did not read Letters until now. While reading the book I was angered. Not because I disagreed with the content, on the contrary. I was annoyed because Mr. Halkin had already so eloquently put into words more than thirty years ago what I have always believed and felt. This moots any possibility that I might some day write something similar myself. Imagine if you woke up one day having, entirely on your own, discovered the truth of a mathematical or scientific principal, such as the Theory of Relativity or the Pythagorean Theorem, only to learn that it had already been discovered long ago. In writing Letters, Hillel Halkin seemed to feel a need to answer the former question. It is not important whether the letters in the book were actually written to an American friend or if Halkin merely used letters as a literary device. Any American Jew who reads this book can imagine that the letters were written to him. The book was written at a time when people still wrote letters. In 1977 there was no email or Skype. There was no Internet or cable television with CNN to keep an American in Israel up to date with what was going on in America. An international telephone call was not only very expensive, but it was difficult to place. Now I have unlimited free calls to the States as part of my cell phone plan. Clearly, with the new technologies mooting letters, we will have fewer sources of information for future historians to study. Volumes have been published just of the correspondence of various historical figures. Today Mr. Halkin would just have held a conversation with his friend for an hour on the telephone at the cost of pennies if that. Certainly no one attempts to write with articulacy in e mails. I was startled at how relevant this book still is today. It is like opening a time capsule to discover that the world had not changed at all in thirty years. That is why I shall refer to it as if it were written today about the current state of American Jewry. The recent Pew study of the American Jewish community caused a great deal of debate and concern within that community. The issues raised in the study, such as dwindling numbers, shrinking synagogue affiliation and intermarriage are all dealt with in Letters. The book also deals with how the American Jewish community owes a great deal of its very identity to Israel’s existence. Anyone from my generation who had a Jewish education and went to Jewish camps knows how important Israel is to Jewish education in America. At my school Israeli Independence Day was celebrated every year and we had special events to educate us about Israel and Zionism. The Ramah camp where I went held an Israel day every summer where the camp was “transformed” into Israel for a day. Mr. Halkin acknowledges that for Americans Zionism was never the same as it was for Jews in countries of persecution. American Jews saw Israel as a place where Jews could find refuge. This became even more important to them after the Holocaust. Mr. Halkin cites the varying forms of Zionism that were espoused by different thinkers and leaders such as Ahad Haam and Herzl long before the Jewish State was established. He reminds us that many did not call on all Jews to move to Israel and many did not even believe in an independent Jewish State. Even Herzl, for whom Zionism meant that all Jews should return to Israel, acknowledged that the American Jewish Community, as early as 1900, was unique because of American democracy. Ahad Haam believed in a Jewish State, but not in the migration of all Jews to it. He felt that a new Jewish community in Israel would become the center of a new world Jewish culture. He was largely correct as his vision relates to American Jews. Hillel Halkin quotes his friend’s letter: “A Jew who questions Israel’s right to prosper in peace is simply a traitor to his people and deserves to be treated as such.” These words were written by a man who also says that he would not want to live in Israel. Here we have the dichotomy, the duality, of the American Jew. He is a Zionist who strongly supports Israel to the extent that he makes such support synonymous with Jewish identity, but he does not want to live here. He is also a loyal American who feels that to imply that support of Israel implies less than full patriotism to America is a form of anti-Semitism. Mr. Halkin, however, is dismissive of the claim that people who call American Jews out on the issue of dual loyalty must be anti-Semites. The issue of dual loyalty, he maintains, is a problem for American Jews precisely because Israel’s security depends so much on the United States. It is therefore not as problematic for Jews who live in other countries. But the problem of dual loyalties does exist for American Jews. “One cannot belong equally to two peoples without the tragic possibility existing of having to choose between them one day. It is American Jewry’s good fortune that such a moment has not yet arrived for it,” he writes. American Jews believe that such a moment will never come because America and Israel share the same democratic ideals. Hillel Halkin recounts the experience of his youth as a student in Israel. He was treated harshly by Israelis when in the country in 1957. “There was everyone trying to tell me how to live my life, or where to live it, as though being an American Jew automatically made me a guilty party who owed them an apology.” Israelis like to make Jews who live abroad feel guilty about it. It makes them feel better and superior to act as if a Jew who lives abroad is less authentic than they. I personally experienced the condescension of Israelis on the subject of aliya (immigrating to Israel) before I moved here. Interestingly, many of the same Israelis who derided me for living the good life in America before I moved here mocked me for being stupid enough to give up that life to come and live in Israel after I made aliya. Mr. Halkin dismisses the possibility that a Jew can be a tourist when in Israel. “He can pretend to be a tourist here, of course, he can act like one in every respect and succeed in being treated like one, but this is different from saying that he is one. In reality … a Diaspora Jew in Israel can be only one thing: a person on trial.” This means that when a foreign Jew comes here he will always be on the defensive and will always have to excuse his choice to not live here whether he knows it or not. 1)	It is natural for a Jew who is committed to his Jewishness to seek to perpetuate Jewish life in himself and in his people. 2)	For objective historical reasons, Jewish life in the Diaspora is doomed. Such life has a possible future only in … a sovereign Jewish State of Israel. 3)	Therefore, it is natural for a Jew who is committed to his Jewishness to desire to live only in Israel. Therein lies the Crux of Mr. Halkin’s thesis. The Diaspora is not only flawed but doomed to extinction. The only future that the Jewish people has is in Israel. Without Israel we will whither away and die out. If a Jew truly wants the Jewish People to continue to exist then he must accept this fact. This is most disconcerting to American Jews. No American Jews – except for the Orthodox who believe that when the Messiah comes he will take all of the Jews back to Israel – believe this. American Jews bask in their dual identities. Few things are more American than to be a hyphenated American, such as an Italian-American, an Irish-American or a Jewish-American. The hyphen can precede a nationality, an ethnicity or a religion and in the case of a Jew all three. There is a growing trend, however, amongst American Jews to drop the religion from their identity. As the Pew study shows, 30% of all Jews today have no synagogue affiliation and this is in addition to all of the people who are technically Jews but who choose not to identify as such – think celebrities such as Bill Maher and Scarlet Johansen. In each generation the percentage of Jews who do not classify themselves as Jews by religion grows. Attachment to Israel is correlated to attachment to the Jewish religion and synagogue affiliation. Those Jews who are a part of a Jewish community and who had a Jewish education are much more likely to support Israel. Letters continues with an excellent summary of Jewish existence in the Diaspora before the modern era. It explains why Jews were able to flourish for so many centuries in Europe and the Middle East. Not in spite of persecutions, but because of them. Jews stuck together as communities spread across international boundaries. Mr. Halkin explains how the world changed and with it Jewish life. I cannot do this history justice in a short synopsis here so you will just have to read this book. Some knowledge of chemistry might help. Mr. Halkin brilliantly compares the Diaspora Jewish world to a volatile gas that, “if not compressed from without [i.e. persecution] it will simply expand in all directions and disappear [i.e. assimilation]. While if pressure is applied to it, this will inevitably become so great as to cause a violent explosion.” In the Middle Ages we had “just enough pressure applied at all points” to maintain ourselves as a distinct people and we neither imploded nor exploded. Such an outside force world wide, however, no longer exists to do the job for us in the Diaspora. He laments his choice to be secular, however, and says, “centuries of Jewish life have come to an end with me, a responsibility I do not take lightly.” This would have happened in America anyway and at least in Israel, he says, he can pass on the tradition in a new and different way to his children. He could not have done this in the Diaspora. His children will not know Jewish law and the prayers as he did but they will speak the Jewish language and know the Jewish country. Hillel Halkin calls this, “the best bargain we Jews can drive with history at this moment. Recently I have been hearing a new term, “Jewyness”, more and more. I do not know where it came from and it seems to be used mostly by Jewish celebrities in America who use their Jewish identity as a cultural shtick while disavowing any religious affiliations – think Sara Silverman. Hillel Halkin criticizes those Jews who whittle down Judaism to only a system of social justice and ethics. “Ethical idealism and the philosophical mind as Jewish traditions indeed, as if these were the distinguishing marks of historic Jewish existence rather than the very symptoms of its disintegration in modern times.” He sees this as a myth that we may have perpetuated amongst the gentiles about ourselves that we have now, unfortunately, adopted for ourselves. One of the letters laments the lack of a truly unique Israeli culture. There is a description of the various cuisines and other aspects of both Ahkenazic and Sephardic cultures which were brought into the Israeli melting pot. But Mr., Halkin sees Israeli’s love of hummus and falafel as more of an adoption of Arab culture from the region in which we live than an expression of an Israeli culture. The Sephardic foods – kube, malawah, jachnun, etc. – are only delicacies of the various Arab countries that the Sephardic Israelis came from. On this point I certainly agree. Israeli culture today is a pale imitation of American culture and generic Western culture. There is little to distinguish Israeliness from Westerness. Even the local pop music is simply a Hebrew version of American music. The Israeli has replaced Jewish identity with Israeli identity. At the very least, however, he celebrates Jewish holidays as the holidays and speaks Hebrew as a first language. This is why, Mr. Halkin explains, that he is not as worried about his daughters assimilating some day as a result of being secular. They live in Israel the Jewish State. Unfortunately, plenty of secular Israelis choose not to be committed to the Jewish world or even to spurn intermarriage. Plenty have moved abroad and intermarried. Israeli model Bar Raphaeli made headlines when dating Leonardo Dicaprio. It should be pointed out that Israelis tend to be ignorant of their own religion. I have often said that having grown up in Christian America I know more about Christianity than the average secular Israeli knows about Judaism. Israelis’ ignorance of basic Jewish practices never ceases to amaze me. When I was in the army I went home for the first day of Sukkot. The day after I returned to my unit and carried the Arba Haminim – the four species – with me. An officer was surprised to see me carrying them and asked, “why do you still need them when the holiday was yesterday?” He was still surprised to learn that one makes the blessing on the Arba Haminim every day of the week long holiday. This is harsh. What about looking at the glass half full? At least these Jews choose to commune with other Jews rather than go to a country club or sleep in on a Saturday. Clearly these Jews are searching for an outlet to express their spirituality that best fits their needs. Mr. Halkin continues with a critique of the Reform and Conservative which would not only apply to the Diaspora, but to the Conservative and Reform in Israel as well. I am not sure why he chose to include this in Letters. Clearly this is a different subject. Hillel Halkin is no fan of the more liberal forms of Judaism. I dot, however, understand why since as he says he is himself secular. That being the case then Mr. Halkin should not be so concerned with how other Jews choose to practice their faith. A later letter includes a synopsis of the various Jewish communities throughout the World from South America to Europe. These hold true today except of course in the case of the Soviet Union. An updated version of the book might deal with those Jews who, after more than twenty years, still choose to remain in the former Soviet republics in spit of anti-Semitism and political turmoil. There is so much more that I could say about this book, but I fear I may have already said too much. If this were a movie review you might end up hating me once you saw the movie. However, I assure you that Letters to an American Jewish friend is a must read for any American Jew. Even Jews from other countries in the Diaspora would find it insightful. As an American Jew who lives in Israel I say that Letters to an American Jewish friend should be required reading for all Jewish students in both Israel and the Diaspora. In the preface to the new edition Hillel Halkin says that he never expected to convince American Jews to move to Israel. He simply wanted to evoke a debate. Some people, like me, might find a compelling argument in support of what we already believe. Others might be angered, even offended, by it. Whichever category you will fall into it is important for anyone to have his beliefs challenged or to let an outsider offer a critique. That being said – Read this book! great write up Gil- it is a really incredible book- raising issues that we all need to be dealing with, for the sake of the health of our people. There was also a great article that the author wrote a few months ago regarding the reprinting. It had some really interesting reflections– quoted a lot of letters he got in response to the book. thanks!